Most manuscripts are incoherent. The plots aren’t very tightly connected and events seemingly happen at random or because the author got bored. One warning sign that your plot is not coherent enough is that mapping out the major plot threads leaves many post-it notes orphaned from the main plot threads. I’d recommend reconsidering the plot items that didn’t seem to fit into the main threads. Are they necessary? Could they be shortened? If they don’t tie into the main plots, why have them? 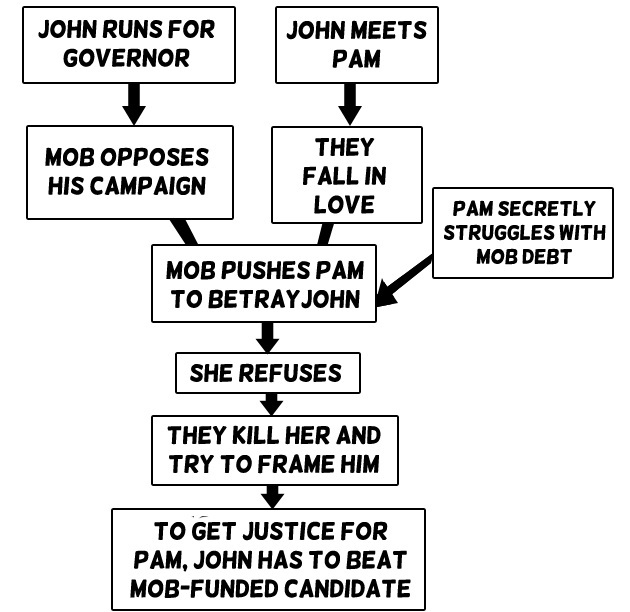 Alternately, try altering the plot so that they tie into the main plot more. (Maybe a hero gains a trait that is very important down the road). Do the main threads connect? If not, I suspect that the story will feel disjointed–moving one plot thread shouldn’t stall the others. For example, in Scott Pilgrim, winning the girl and beating the villains are very closely related, not only because the villains are the main obstacle to the romance but because the relationship between Scott and Ramona is both developed and strained by Scott’s uneasiness about getting constantly attacked. If a different order strikes you as more logical, go for it. Are there any points where you could jump from A to C without B? If so, read through B carefully to see whether you can get rid of it. My agent forwarded a rejection for my superhero novel yesterday. I’m pretty sure the editor would’ve wholeheartedly endorsed this post, curse you both! If you’d like, I can take a look at the manuscript and make some suggestions. Superheronation-at-gmail-dot-com is my e-mail address. I need some help with what to do about Adrian’s training. I want him to be a competent superhero, but I don’t want to spend time on training when I could be advancing the plot. Originally, I had planned for there to be a one month skip so that afterwards he would have all the training he needed, but I don’t want the story to skip that far ahead. I’ll probably shorten it to a week skip, but give a little explanation to his skills. Since he doesn’t really have a past I plan to stock it full of things that would prepare him for superhero-dom. For example, I want him to explain his time in dance and track being the reason he’s fast and agile. Also, time walking the streets in San Libre has taught him some street-fighting. His acting brings his ability to think on his toes and be tricky. And of course during the week skip he would get some formal combat training from Lae’ Trelle. I want him to be a novice-hero. I don’t want him to win by luck, but by his skills and ability to be creative even if he isn’t that experienced in combat. I think it could work and be interesting. “I want him to be a competent superhero, but I don’t want to spend time on training when I could be advancing the plot.” If you’d like, you could handle the first week in a montage 1-2 pages long. Also, I’d recommend watching the movie Bad Company. It has a cool CIA training sequence. One of the biggest problems with novice manuscripts is events that sprawl. In real life, one thing happens and then another. In novels, one thing happens BECAUSE of another. A satisfying story brings elements together; a novice one keeps inventing new ones. Really useful post – plus I’m a sucker for anything involving diagrams. I’m going to tweet this! Maybe this is related, maybe it isn’t, but I don’t know where else to put it. In my novel, there’s a lot of things happening simultaneously, like there’s a chapter where two of the characters are blowing up the school science lab. Next chapter, another character is practicing cheerleading nearby, and hears an explosion. In an occasion like that, it’s quite clear that they happen at the same time, but later on, it doesn’t work out so well. At first, I tried switching between the characters as much as posible to keep it chronologically correct, but when I gave it to someone to read, they said it was too confusing. I’ve changed it so that it sticks with the same character for longer, but with a clock at the beginning of each major change, or when it becomes important. Is there any better way to do this? Without acutally reading your chapters I can say exactly what it is in your story that isn’t working. I don’t think there should be a problem with switching between the two POVs. My only recommendation would be to show the two in the science lab right out to the point of the explosion. Then as soon as the explosion happens you should cut to the cheerleader, and giving a page or two transition before the cheerleader hears the explosion. As I am writing this, I can’t help but wondered what is the point of switching to the cheerleader’s POV. Whatever the purpose is, whether it be the cheerleader saving the day or being exposed to something that empowers her, I’m thinking that you should only switch back to the two from the science lab after the reason for switching to the cheerleader has been accomplished. You probably don’t need to do any rewriting. What you need to do is find that perfect area in each POV to make the transition. Hope this is helpful. “I’ve changed it so that it sticks with the same character for longer, but with a clock at the beginning of each major change.” I think it’d be a bit hard for readers to use a clock, unless they can easily remember what time it is when (say) the lab explodes. Rather than a clock, I would recommend something like Fifteen minutes before… at the start of the cheerleader’s chapter.